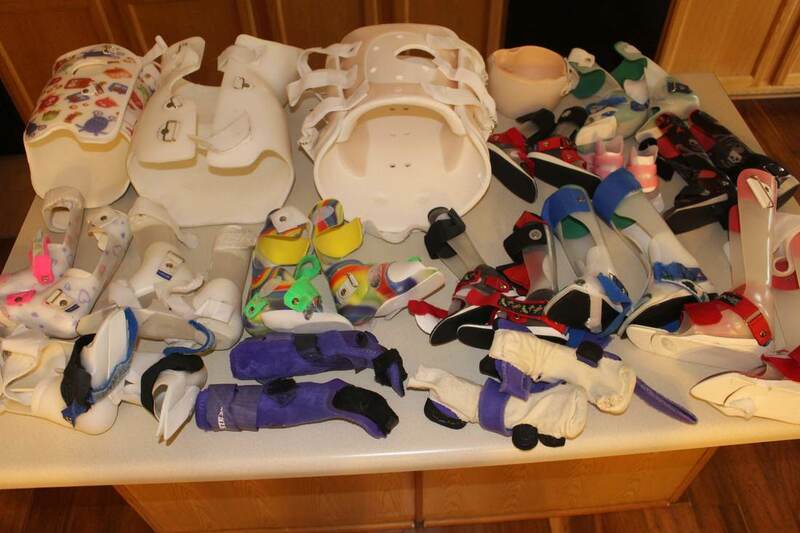 Valentina was one of our first two children to receive leg braces back in 2012, when students at Kauri Sue Hamilton School in Riverton, Utah first donated their outgrown braces to children with disabilities in San Ramon, Peru. We got to see her take her first steps. Valentina was five then and now she’s twelve, a beautiful girl with cerebral palsy who lives with her grandmother. She lives in extreme poverty, attends a regular school, and walks with difficulty. “I’d like to get you a present,” I told her. “What would you like?” She was silent for a moment, then glanced around her small home and answered, “Nada, tengo todo.” Nothing, I have everything. We got her a new walker and some new shoes and socks. And the gift that she gave us was priceless. What is this pull that Peru has on me? I step off the plane and I want to go back. Our trip was amazing. We have so many stories to tell. Here are just a few things that happened. I’ll write more about them in coming weeks. Amigos de San Manuelito, our nonprofit organization, has our first board member in Peru. We met a girl whom we thought needed a wheelchair – and we ended up buying her a bike. Even though we had promised ourselves we wouldn’t, we added a new school. It started with an ice cream cone. And we visited a 12-year-old girl, our friend since she was five, who lives in severe poverty, in a one-room home with her grandmother. I told her, “I want to buy you a present. What would you like?” She was quiet for a minute, then answered, “Nothing. I have everything.” We bought her new shoes. 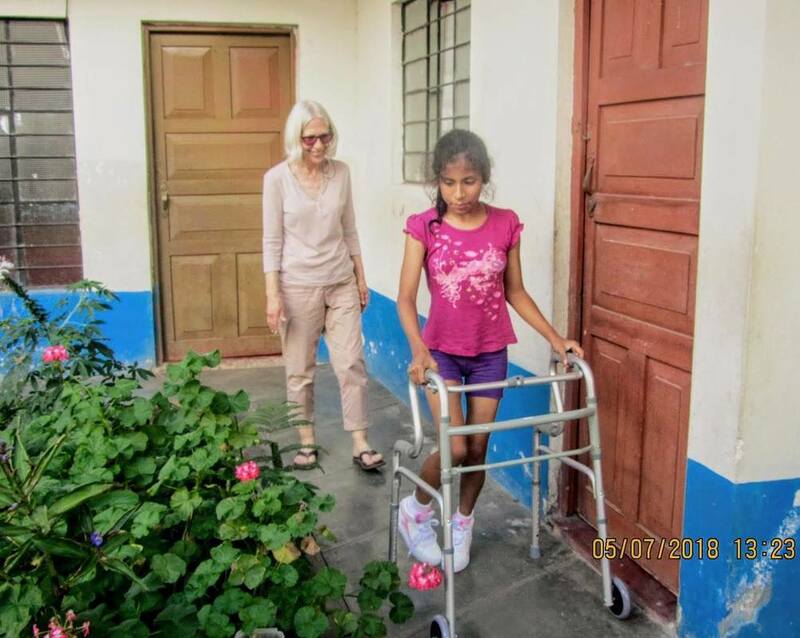 Every time I close my eyes, I see the children’s faces.
. . . the mother whose daughter with severe cerebral palsy is 12 years old, cannot walk and talk, and has never had a wheelchair. This family took us shopping. The mother went in the store with us while the father waited with their daughter.
. . . the grandmother raising her abandoned grandson with severe multidisabilities. She also cares for her invalid husband. She’s just one of several grandmothers we’ve met who are raising their abandoned grandchildren.
. . . the mothers of children with seizure disorders who cannot afford their medication.
. . . the mother of the little boy with autism, holding his hand as we walk to the shoe store, hoping he won’t run away, hoping he’ll sit still to try on shoes.
. . . the mother of the child who just turned 20, who will receive no adult services because the family cannot pay. These mothers are our heroes. They welcome us, often into their homes, talk with us, tell us pieces of their stories. They laugh, cry, and dance. They bring their children to school, walking mostly, because there are no school buses. The school is their place of hope, their place of friendship, their place of understanding. The love in their eyes is as bright as their children’s smiles. Their faith in God carries them through difficult days. ​ We listen, learn, grow from their courage, their wisdom. 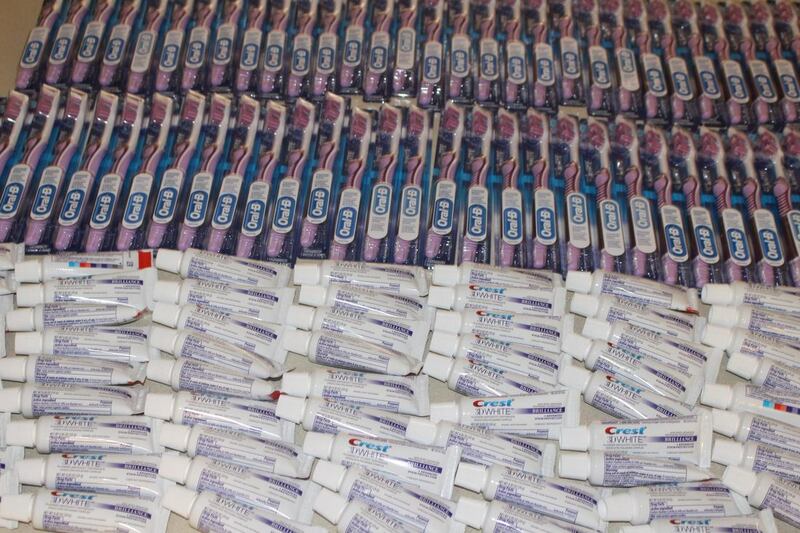 We give what we can – climbing equipment; shoes; money for medication; sometimes, not often enough, a wheelchair; toothbrushes; leg braces; a bicycle. Then we go home. But their words stay with us, their faces, their fears, their dreams. ​ These mothers are our heroes. Happy Mother’s Day, 2018, to the mothers of children with disabilities in Peru. ALMOST ready . . . for our trip to Peru, to work with our amazing friends and colleagues there at two schools for children with disabilities and two infant-toddler early intervention programs. Thank you to everyone who’s helped. We’re so grateful. 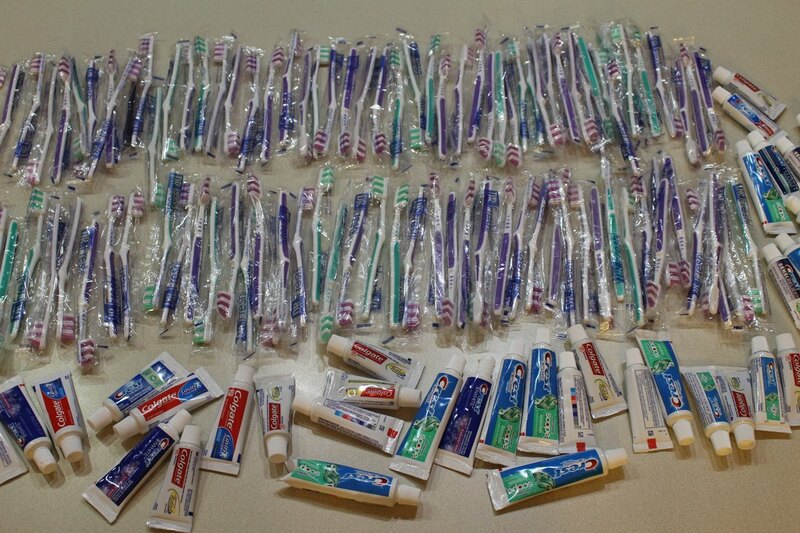 Thank you to Dr. Brandon Robison, our dentist in South Jordan, UT, and to King Fish Towing in West Valley City for their donations of toothbrushes and toothpaste. 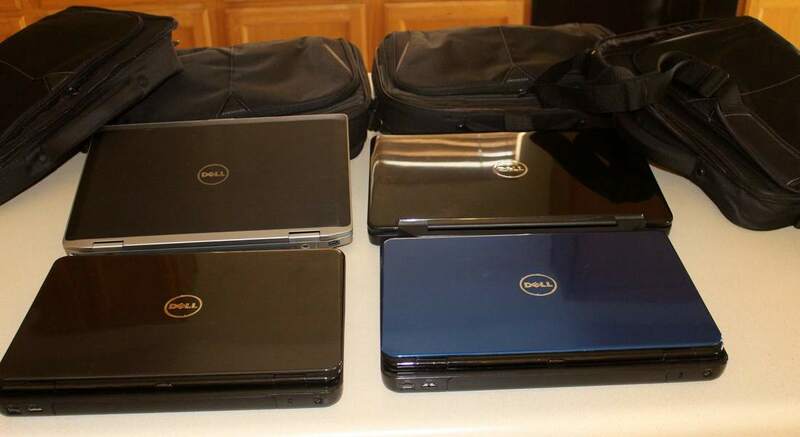 Thank you to Brian and Jason, at Affordable Laptops in Riverton, who donated computers. And thank you to the children, parents, and staff of Kauri Sue Hamilton School for children with severe disabilities in Jordan School District who are letting us find new homes for outgrown braces and giving children thousands of miles away the opportunity to walk. Thank you to everyone who has donated. In a sense, you all go with us. We pack a lot of gratitude into our suitcases. Muchas gracias, amigos. Que Dios los bendiga. Hasta luego. We’re going to Peru! It’s been almost two years and I’m homesick for our second home. We’re partners there with two schools for children with disabilities, one high in the Andes mountains and one in the jungle, along with early intervention programs for babies and toddlers at each location. This will be our ninth trip in eight years. Thanks to generous friends and family, we’ve been able to provide wheelchairs and walkers, seizure medications, a refrigerator, computers, communication materials, a playground. But that’s not what I want to talk about. I want to talk about what our Peruvian family and friends give to us. The teachers become our teachers. The children with disabilities become our teachers. People begging on the street become our teachers. The priest running a food pantry at the Catholic church becomes our teacher. And I have much to learn. Francisco’s family becomes my family; my sisters and brothers, my nephews and nieces, my cousins. They take us into their homes, feed us papa a la huancaina, lomo saltado, leche asada. A niece washes our clothes by hand. A nephew drives us across the Andes, takes us on paths where we see llamas, alpaca, vicuna. We dance on a rooftop, join hands in ancient songs. We talk late into the night, hearing tales of their parents, their grandparents, their struggles, their dreams. We belong to a world where we are sisters and brothers, extended family, beloved friends. I go to Peru as a teacher, or I think I do, with gifts to contribute to them. But I’ve found, each time we’ve gone, that I am the student, sitting at their feet, astounded at their wisdom, grateful, beyond words, for their love. Muchas gracias, familia; muchas gracias, amigos; muchas gracias a Dios. The Dream Continues . . .
“We have a dream,” said the teachers last year at PRITE Huancayo, an early intervention program high in the Andes mountains for children from birth to age three. Their dream was to serve their students a snack every day. They told us all their reasons for giving the children a snack – language development, social interaction, turntaking skills, sharing, making choices, learning use of utensils, and of course nutrition – the same reasons I always gave my students snacks. So we spent the rest of the day shopping, going from small store to small store for several hours, and bought a microwave, a blender, thermoses, plates, cups, bowls, plasticware, a dishpan, and a drainer. And this year they received a refrigerator. We weren’t able to go to Peru this year, for several reasons. But we were able to send some money to the schools. 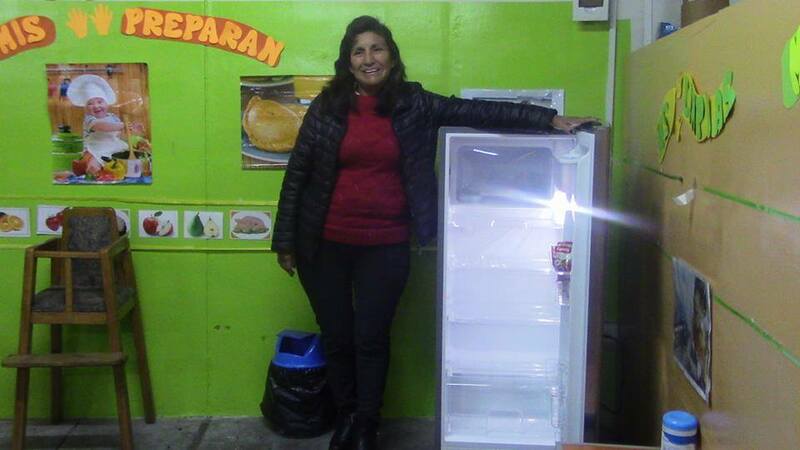 And the amazing, dedicated teachers of PRITE Huancayo have a refrigerator now and can expand the variety of snacks they’re able to serve their precious students. Feliz Dia del Maestros a los maestros increibles de los ninos con discapacidades en las escuelas San Manuelito y PRITE San Ramon en San Ramon, Peru y Senor de los Milagros y PRITE Huancayo en Huancayo, Peru. Happy Teacher's Day to the incredible teachers of children with disabilities in the schools San Manuelito and PRITE San Ramon in San Ramon, Peru; and Senor de los Milagros and PRITE Huancayo in Huancayo, Peru. Amigos de San Manuelito envía nuestra más profunda condolencia a Catherine Paola Krammer Dávila por la muerte de su amado padre. Catherine es directora de la escuela San Manuelito para niños con discapacidades en San Ramón, Perú y es nuestra buena amiga. Amigos de San Manuelito sends our deepest sympathy to Catherine Paola Krammer Davila on the death of her beloved father. Catherine is director of the San Manuelito School in San Ramon, Peru, and is our good friend. From serving in a food pantry on Saturday mornings to helping in a health clinic in the Dominican Republic, Claudia Bauleth’s compassion for others is evident wherever she goes. She’s the newest member of the Amigos de San Manuelito team and is financial secretary of our organization. Claudia was born in Lisbon, Portugal. She lived in Angola and Brazil prior to moving to Salt Lake City, Utah in 1982. She graduated from the University of Utah with a bachelor’s degree in chemistry and has worked for a water utility for over 26 years. Claudia enjoys scuba diving, water skiing, camping, and hiking. She loves animals. Claudia volunteers regularly at the Granger Community Christian Church food pantry in West Valley City, Utah. In January 2017, she traveled to the Dominican Republic with Building Bridges of Hope, an organization serving communities in the Dominican Republic. She interacted with children in an orphanage, helped with a health clinic in a mountain area, visited a home for the elderly, and helped at an elementary school. Claudia is grateful to be an Amigo. 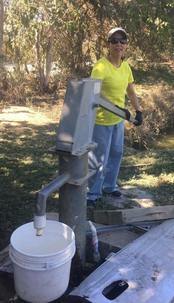 She says that she truly enjoys helping others and feels honored to be part of the board of Amigos de San Manuelito. 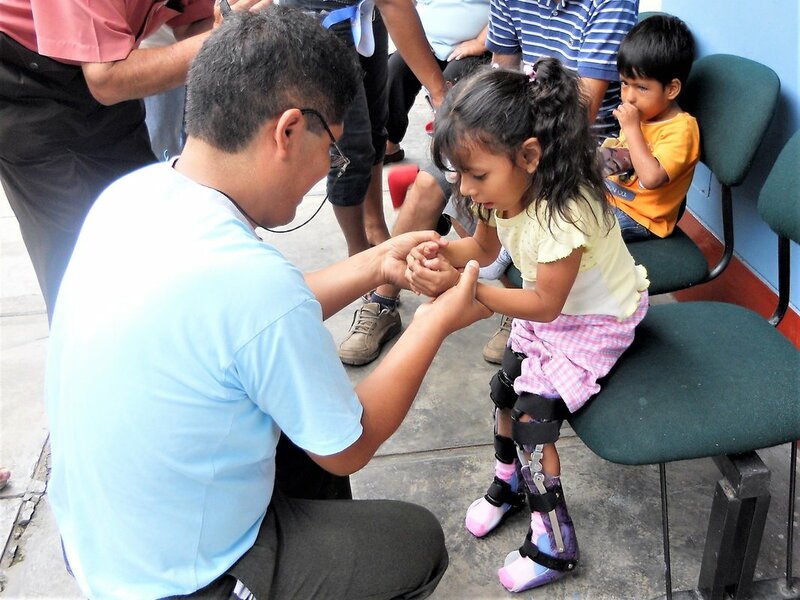 Nearly a year ago, two little three-year-old girls in Peru received leg braces. Today they are walking. They’re students at the San Manuelito School for children with severe disabilities in San Ramon, Peru, the first school we assisted and the namesake of our organization, Amigos de San Manuelito. Their braces were donated by students and parents of Kauri Sue Hamilton School for children with severe disabilities in Riverton, Utah. The students at Kauri Sue have outgrown them and their parents generously gave them to us to take to Peru. 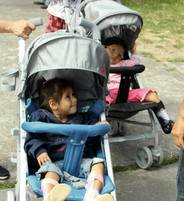 So thanks to the efforts of parents, teachers, and therapists on two continents, both girls are walking. Congratulations, little girls. Felicitaciones, ninas. This is why we go. Por eso vamos.